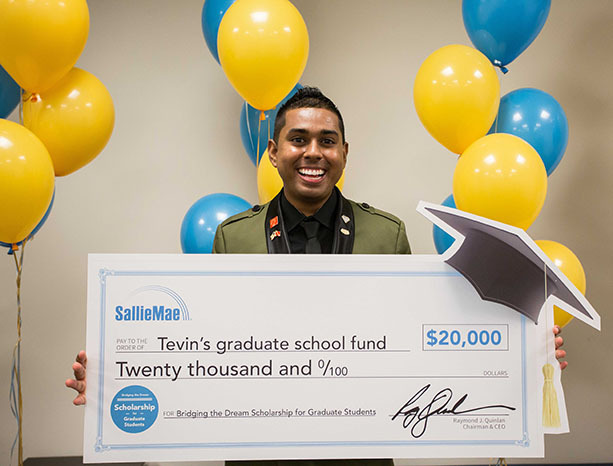 Tevin Ali and the three other winners were surprised with the scholarships during what they believed were finalist interviews at Sallie Mae’s office in Newton, Massachusetts. When Tevin Ali graduated from Palm Beach State College in 2015, he was already considering Johns Hopkins University for graduate school. Now as a winner of a $20,000 Sallie Mae Bridging the Dream Scholarship for Graduate Students, one of four awarded nationwide on April 30, Ali can realize his goal without financial worries. After earning an Associate in Science degree in Biotechnology at PBSC, followed by a B.S. in Biological Sciences from Florida Atlantic University in 2017, Ali enrolled in the Master of Biotechnology Enterprise and Entrepreneurship program at Johns Hopkins University. He has just completed his first year in the program, and the scholarship will cover the last year, leading to his graduation in May 2019. Ali, 26, aspires to become a leader in genomics and an empowering public speaker to create a positive impact on the STEM community and biotechnology industry. He recently launched Talk with Tevin LLC, and his next speaking engagement is at the Eduventures Summit 2018 in Boston next month. Living locally and doing his master’s degree online, Ali recently took a part-time job at PBSC as a student development advisor for the tresPATHS Project, based on the Boca Raton campus. A Hispanic-Serving Institution Title III project, tresPATHS supports Hispanic and low-income PBSC students who are interested in pursuing specific STEM bachelor’s degrees at FAU. Thus far, Ali has impressed his supervisor, Dr. Candice Maharaj, program grant director. Sallie Mae received more than 3,400 submissions from current and aspiring graduate students for the scholarship. The other 2018 recipients are Albert Appouh of New Jersey, Noor Hasan of Illinois, and Cody Sain of Tennessee. The winners, joined by their family members, were surprised with the scholarships during what they believed were finalist interviews at Sallie Mae’s office in Newton, Massachusetts. Sallie Mae is a student loan company with more than 40 years of providing student loans for college, supporting graduate and undergraduate study, and more. Congrats, we are proud of Tevin and PBSC! CONGRATS Tevin, as if there was any doubt you would not get it as you so deserve this! I am so happy and proud of you! So proud of this young man. Tevin is the embodiment of ambition, compassion, drive, professionalism, and inspiration. Palm Beach State College, you should really take full opportunity in having this Alumni be your future Commencement Speaker!